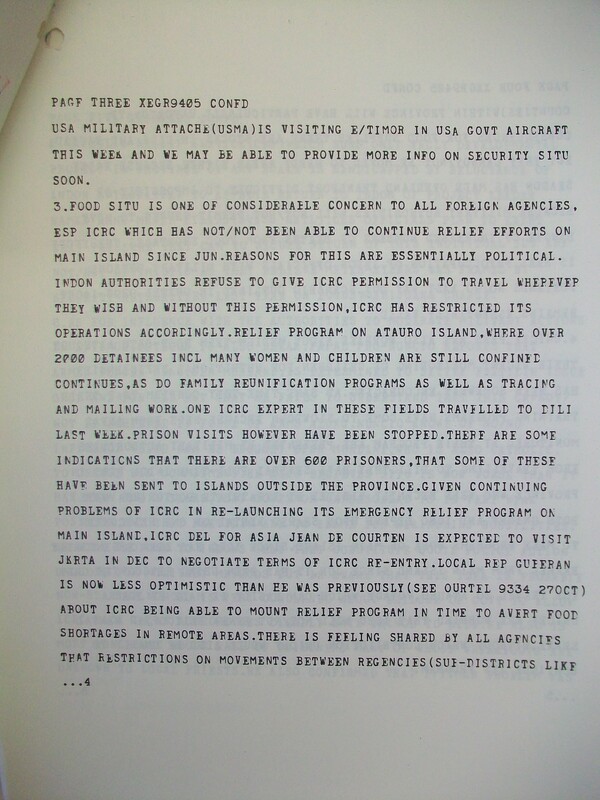 In 1983, an Australian newspaper reported that Indonesian forces had used incendiary devices in bombing runs over East Timor, a former Portuguese colony that they invaded and occupied in 1975. This was the height of a brutal counter-insurgency war which, human rights groups said, claimed as many as 200,000 Timorese lives. After the report in The Age, Australian officials denied the story. Yet Timorese leaders and human rights groups continued to insist that the Indonesian armed forces had used napalm in bombing runs. 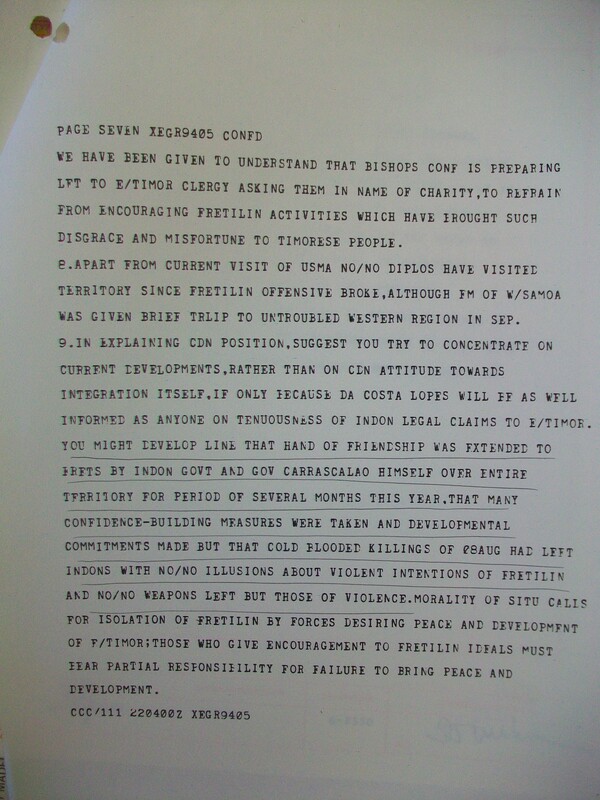 After East Timor gained its independence, eyewitness testimony delivered at the new country’s truth and reconciliation commission again repeated the allegations about napalm use. A version known as opalm was reportedly purchased from the Soviet Union and used in bombing runs by American-supplied aircraft. 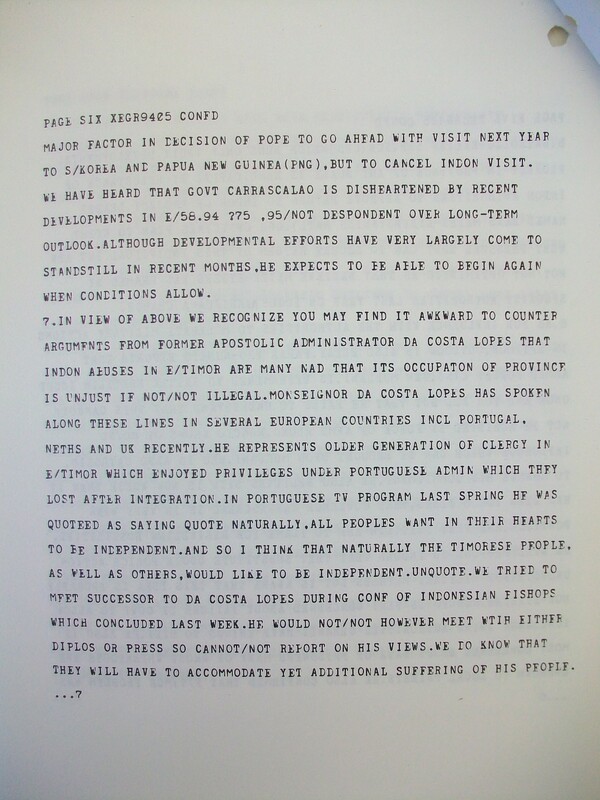 The story is summarized by Clinton Fernandes in his online Companion to East Timor. 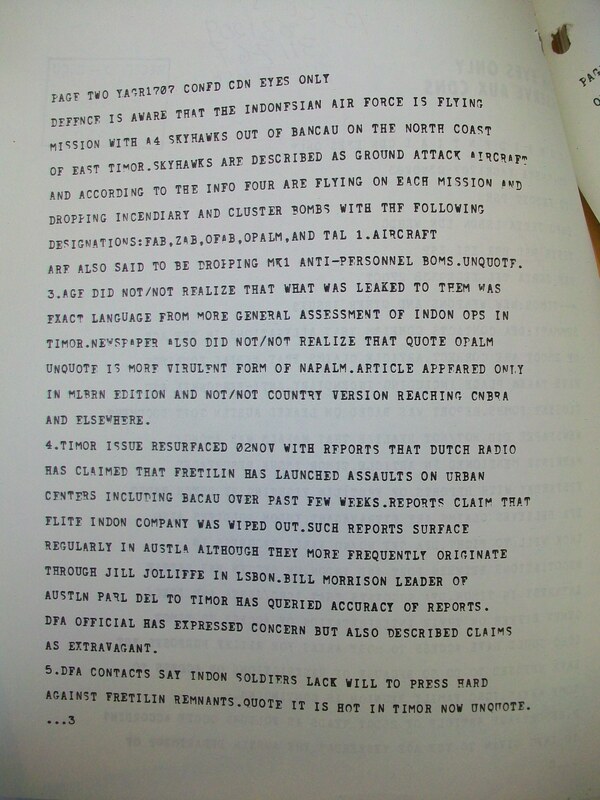 The Indonesian government promptly denied the use of napalm. 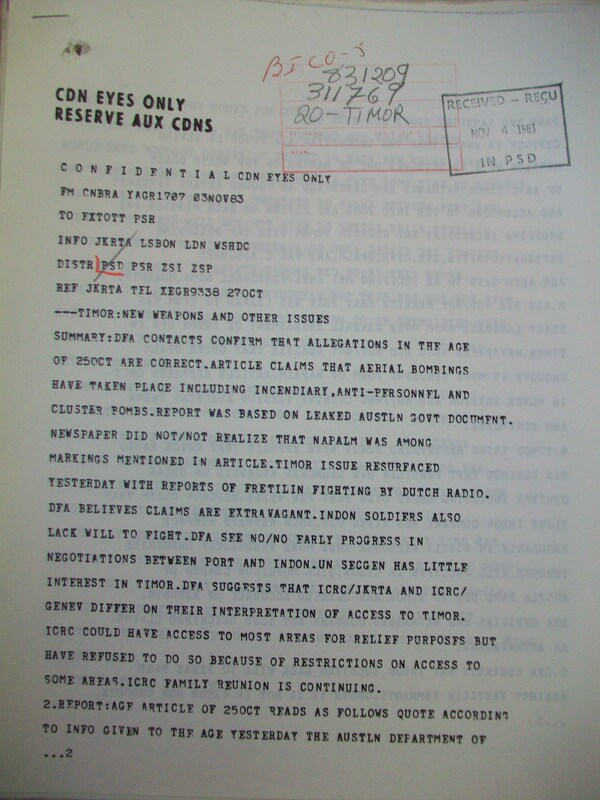 This week, the Australian media began to report another discovery by Clinton Fernandes: newly declassified Australian documents from 1983 confirmed that napalm was used, Australia’s department of foreign affairs and trade was aware, and Australia’s government did nothing. In research on contemporary history, corroborating sources can be important. A look at new Canadian government documents confirms the use of opalm, confirms that the Indonesian and Australian governments were aware, and also shows that Canada’s department of foreign affairs knew — and chose not to act on the information or share it with members of the Canadian parliament. 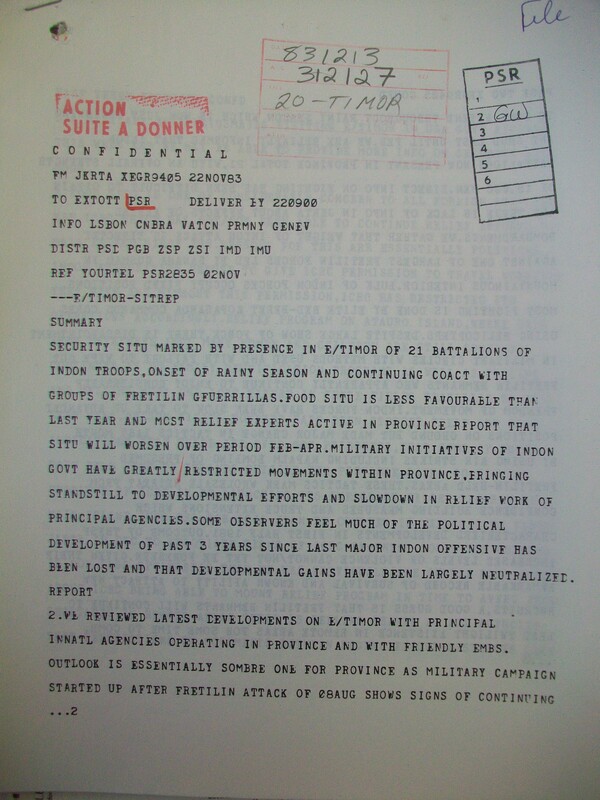 The relevant Canadian documents, declassified at my request, appear below. Thanks to Jamie Bowbrick for research assistance with these documents. 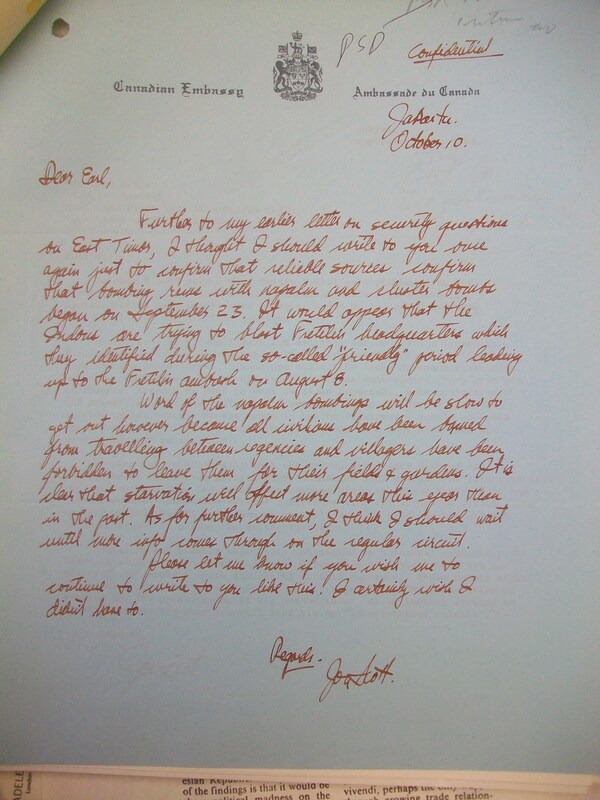 1) Canadian diplomat J. Scott sent a personal and confidential letter from Jakarta to the Department of External Affairs in Ottawa on 10 Oct. 1983, reporting that “reliable sources confirm that bombing runs with napalm and cluster bombs began on September 23.” In general, “reliable sources” in Canadian embassy reporting from Jakarta included the Indonesian foreign ministry, military sources, and/or the Jakarta-based CSIS think-tank, close key figures in the Indonesian regime. 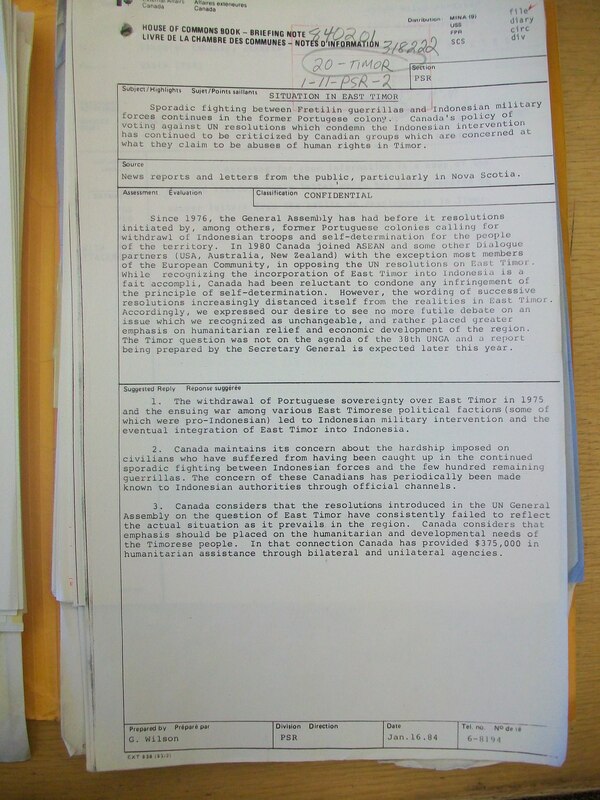 3) Canadian Department of External Affairs response to napalm reports, confidential letter to embassy in Jakarta, 15 Nov. 1983. 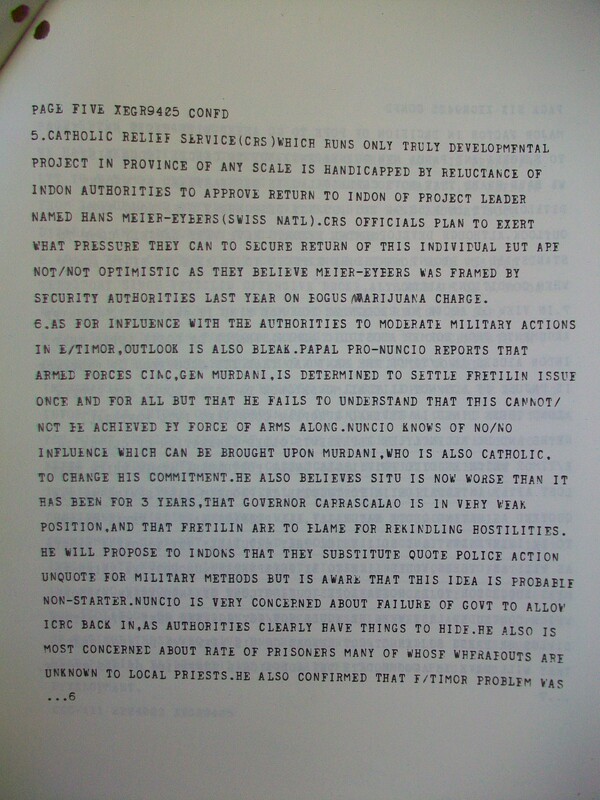 The DEA first learned of napalm from the embassy in Jakarta, and then confirmed it with other sources. 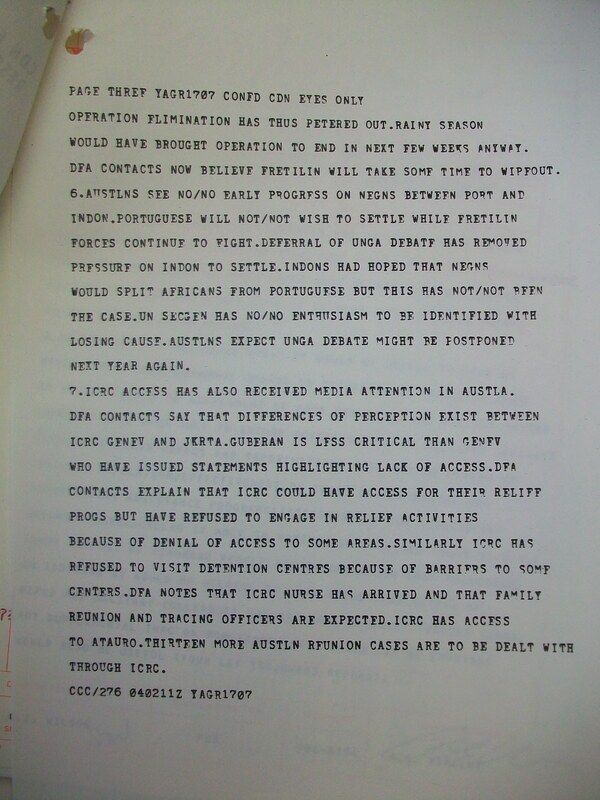 Presumably this means Australian counterparts: although the United States government was aware of napalm use, there is nothing on the DEA file to indicate that US sources shared this intelligence with Canada. 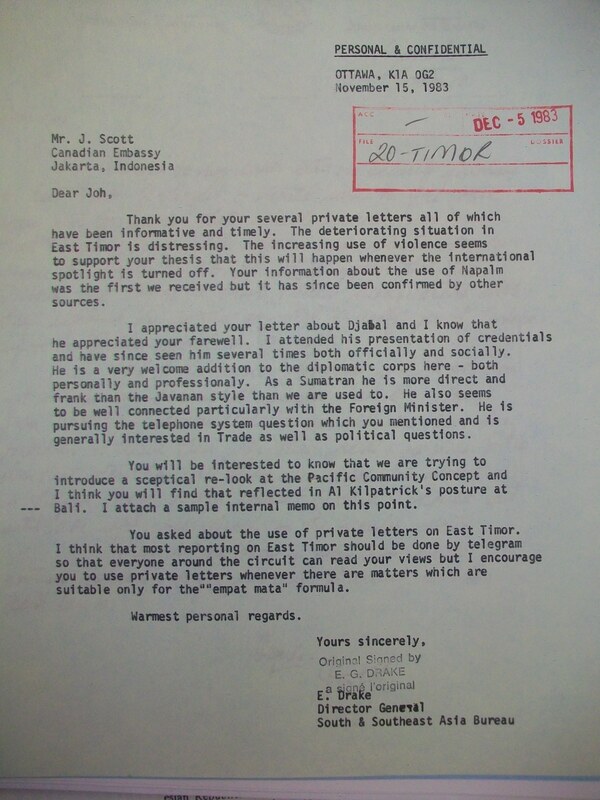 4) Canadian embassy in Jakarta to Department of External Affairs, 22 Nov. 1983. 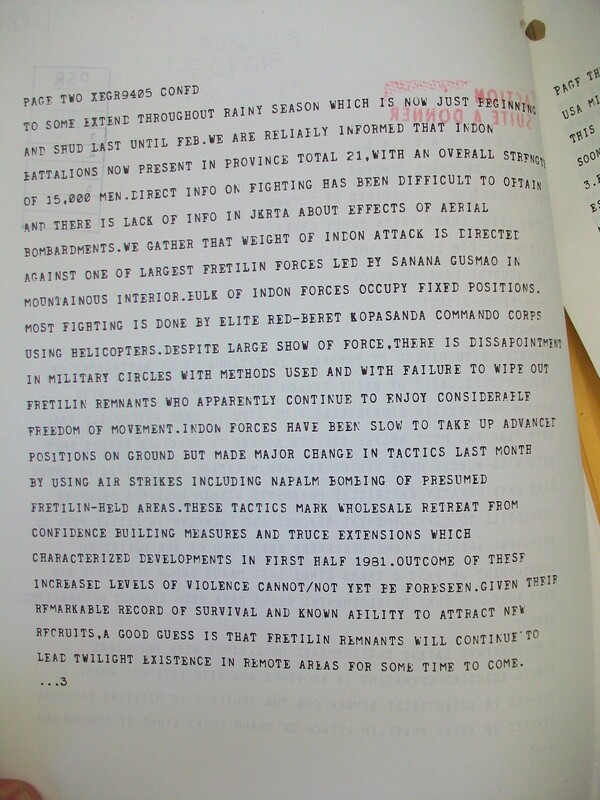 A full report on current situation in East Timor which confirms “air strikes including napalm bombing” (page 2 of this lengthy report). 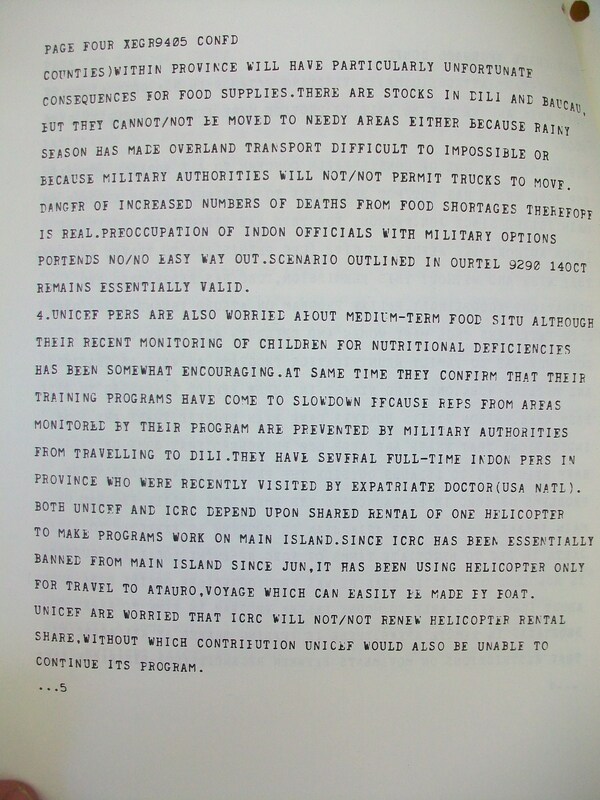 5) A briefing note for Canadian members of parliament issued in early 1984 (the first public document following the reports on napalm) made no mention of the “air strikes including napalm bombing” and instead defended Canada’s UN vote on the side of Indonesia.